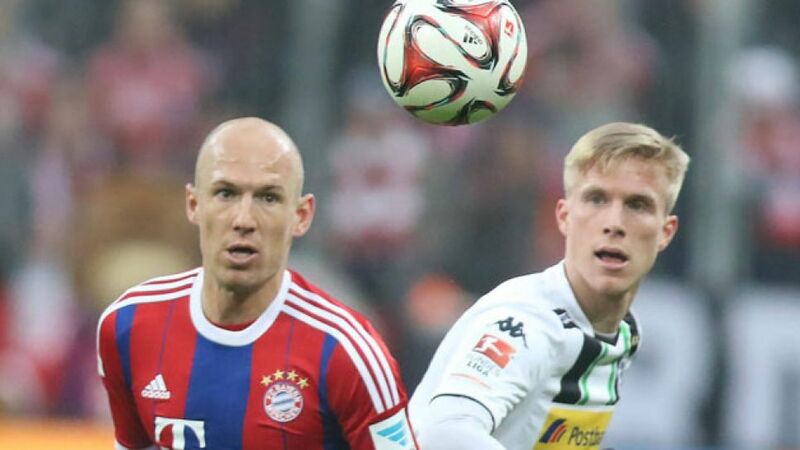 Munich - Borussia Mönchengladbach left-back hailed his team's "fantastic performance" in beating FC Bayern München 2-0 away on Sunday evening, a victory that kept the Foals on course for automatic UEFA Champions League qualification. Speaking exclusively to bundesliga.com after the final whistle, the 29-year-old Sweden international reflected on the sensational victory and what it means for Gladbach's season. bundesliga.com: Oscar Wendt, you’ve just beaten Bayern 2-0 away from home. How does that feel? Oscar Wendt: Of course it’s a massive result for us. I think it’s definitely the most difficult away game in the Bundesliga. The way Bayern have performed over the last few years they've shown that they’re one of the best teams in Europe and in the world, so to come here, keep a clean sheet and score twice is a massive result. Our performance was fantastic. We maybe didn’t play that well in the first half but we defended well, and in the second half we were fantastic. We kept the ball when we could, we had some great counterattacks and over the 90 minutes I think we created more big opportunties than they did, so you can say that we deserved to get the three points. bundesliga.com: What was your strategy going into the game? Was it as simple as letting Bayern have the ball and looking to catch them on the break? Wendt: Anyone who’s seen us this season knows that we’re a team that wants the ball as well, but we knew that when you play Bayern that they’re fantastic in possession and they play great football. We knew that this would be a game where we wouldn’t see as much of the ball as we’re used to, but we accepted that, took the challenge on in defence and we knew that when we got the ball we had the quality and speed to create something. We were patient at the back and when we got the ball we tried to do something, especially in the second half when I think we were excellent. bundesliga.com: How different is it playing Bayern without Arjen Robben and Franck Ribery? Wendt: Robben and Ribery are extremely good one-on-one. It’s almost impossible to stop them because they have so much speed. They can go on your outside or on your inside, but I think we did a good job doubling-up for the time Robben was in the game, and we just had to make sure that when he wanted to shoot that we pushed him as far away from the goal as possible. If he gets the chance to cross you have to be there and be alert. They stretch the play very wide with Rafinha and Juan Bernat so we knew it'd be impossible to stop them getting crosses in altogether. However, I think we coped with it very well, so it was a great performance defensively and offensively, especially after the break. bundesliga.com: The win means you edge ahead of Bayer 04 Leverkusen again into third place. Are you aiming for the automatic UEFA Champions League qualifying places? Wendt: Our aim in general is to be better than last season. Now we’re in the top three and eight points ahead of Schalke in fifth place, so of course we’re going to try to stay there as long as possible and we’ll fight to get one of those magical Champions League spots. bundesliga.com: Now you have a couple of weeks' break before playing TSG 1899 Hoffenheim. Will it be hard to come back down to earth after a game like this? Wendt: No, I don't think so. Normally we’re good at being ready for whichever team we play, so I don’t have any worries about that. Now it’s going to great to have some days off and just enjoy the victory before we go back to hard work again.